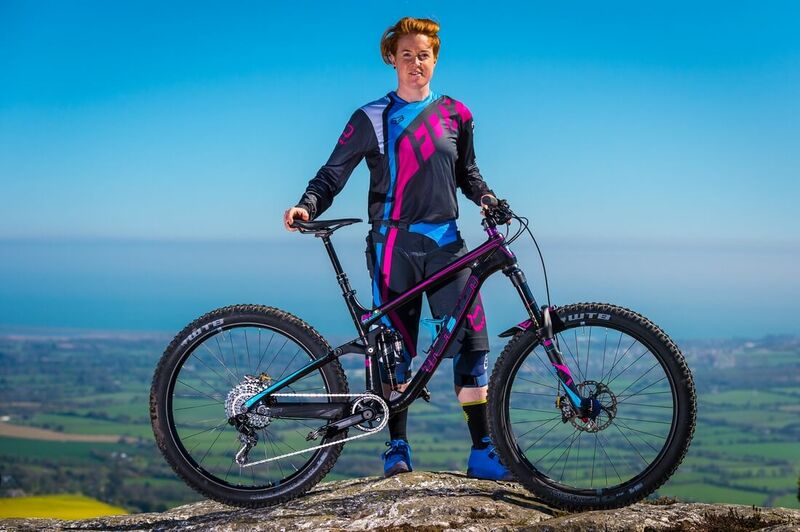 Flow MTB rider Michelle took part in the second round of the Polygon Grassroots Enduro Series at Killaloe, County Clare. The second round of the Polygon Grassroots Enduro took place in Killaloe, County Clare on Sunday. A grassroots enduro mountain bike race series, run by local mountain bike clubs in Ireland, is very much as challenging and technical as the National Enduro competitions around the country. The format is different to the regular Enduros as its blind racing, so no practice day, with three timed stages that riders can attempt as many times as they wish in the allocated time. Most riders do each stage twice, which is exactly what I did. With a short coffee stop on the way, and Will’s wonderful driving skills, we arrived in the beautiful village of Killaloe in just two hours. I picked up my new Transition Carbon Patrol from The Bike Rack Dublin on Friday and went on its maiden voyage on Saturday, the day before the race. I was really excited about my first race on this awesome bike and getting into my snazzy new Flow MTB Fox team kit! I literally found my flow immediately on the Patrol and had so much fun opening up on the bike. After spending a short while registering and catching up with mates, many of whom I hadn’t seen since last season, we headed up the climb to give stage 3 a crack. Hearing that this was a freshly built stage, I decided that I would tackle this one first before it got torn up. The bike felt super fast, and it felt great just letting it go flat out, pushing it to its limits! The only mistake I made was not getting used to the new cleats for my new ION Rascal shoes that I hadn’t quite positioned right, and spent the first stage trying to get clipped back in while rolling down steep, rooty sections unclipped! Recipe for disaster! Thankfully I was able to go back and attempt it again after some readjusting of my cleats. I did all stages twice, with my second attempt being my best runs. Stage 1 was a pedally stage that had fast chutes and open sections that the bike just wanted to go. Stage 2 and 3 were much more technical with lots of roots and off camber sections, rock gardens and some really nice jumps thrown into the mix. The lads at LMBC did a seriously great job on these trails and after the success of the race there last year, it was no wonder that this round sold out in under an hour. Delighted with how the whole day went, and how the new bike felt, we headed back home in the camper full of the joys of life : ) A few photos down at the lake, we said our goodbyes, until next time! Well done to all the LMBC crew, bikingdirty, the marshals and photographers- especially my old pals from Galway MTB Andy and Kian Bichard – who put on a really well organised and seriously fun race. Already planning my next trip down west! Massive THANK YOU to Al Maxwell at the Bike Rack Dublin for having my bike ready for me in time for this race. To Flow MTB for kitting my out in this super stylish gear (definitely makes you go faster ; ) and to WTB for their support this year.